What Is the PAST for Air Force Pararescue and Combat Controller? This test must be conducted in the order listed below and within a 3-hour timeframe. Record PAST results on unit letterhead. If the member is unable to meet any minimum standard, they have failed the test and the test will end at that point. However, the member should continue to take the remainder of the test (if willing) to determine other weak/strong points of his physical condition. Test administrators should sign and have commanders endorse test results with a copy provided to the member. 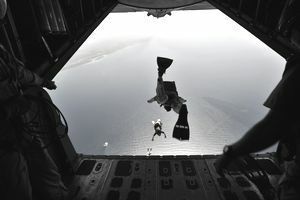 The 25 meters underwater swim should be demonstrated first either through actual demonstration or by use of the training video that has already been supplied to recruiting squadrons. If members surface or break the water surface during any portion of the swim, the test will be stopped and considered a failure for the entire PAST. Swimsuits and swim goggles are the only equipment items allowed. Do allow a 5 to 10-minute rest before the next event. Members should carefully stretch for the swim during this break time. This swim is conducted using the freestyle or side stroke. The maximum time limit is 26 minutes (26:00). The swim is continuous (non-stop). If a member stops any time during the swim, the test will be stopped and considered a failure for the entire PAST. Swimsuit and goggles are the only equipment items allowed. After completion of the swim, allow a 30-minute rest prior to the next event. Members should carefully stretch for the run during this break time. The maximum time is 10 minutes, 30 seconds. PT clothes and good running shoes are the only required items. This run must be continuous (non-stop). If a member stops anytime during this run, the test will be stopped and considered a failure for the entire PAST. Members will be given a 10-minute break prior to the next event. The test should be conducted on a measured running track. Four calisthenics exercises are evaluated, each with specific time parameters and specific exercise form mechanics. All members will exercise to either muscle failure or time completion, whichever occurs first. The intent here is to have members do as many "good form" repetitions in the time allotted or when muscle failure is reached. Note: In performing all calisthenics, the exercise’s proper form must be followed. Deviation from the form to allow extra repetitions will be to the member’s disadvantage. Exercise form is strictly enforced during the training pipeline. Complete a minimum of 8 chin-ups within a 1 minute time period. Chin-ups are a two count exercise. Starting position is hanging from a bar, palms facing the candidate, with no bend in elbows. Hand spread is approximately shoulder width. Count one, pull the body up until the Adam’s apple clears the top of the bar. Count two, return to starting position. Legs are allowed to bend, but must not be kicked or manipulated to aid upward movement. If the candidate falls off, stops, or releases the bar, the exercise is terminated. Candidate will exercise to muscle failure or time completion. Complete a minimum of 50 Flutter-Kicks within a 2 minute time period. Flutter-Kicks are a four-count exercise. Starting position is laying flat on back with the feet and head approximately 6 inches off the ground. Hands are under the buttocks with fists clenched to support the lower back. Count one, raise the left leg off the ground to approximately a 45-degree angle, keeping the right leg stationary. Count two, raise the right leg off the ground to approximately a 45-degree angle, moving the left leg to the starting position. Counts three and four are repeats of the same movements. Legs must be locked, with the toes pointing away from the body. If the member rests his legs on the ground or stops the exercise movement to rest, the exercise is terminated. Member will exercise to muscle failure or time completion. Complete a minimum of 50 push-ups within a 2 minute time period. Push-ups are a two-count exercise. Starting position is hands shoulder width apart with arms straight and directly below the chest on the ground; the legs are extended, and the back and legs remain straight. Count one, lower the chest until the elbows are bent at a 90 degree or lower angle. Count two, return to the starting position. The only authorized rest position is the starting position. If the knees touch the ground the exercise is terminated. The member will not raise his buttocks in the air, sag his middle to the ground, or raise any hand or foot from their starting position. If a hand or foot is raised, the exercise is terminated. Member will exercise to muscle failure or time completion. Complete a minimum of 50 sit-ups within a 2 minute time period. Sit-ups are a two-count exercise. Starting position is back flat on the ground, fingers interlocked behind the head, head off the mat, and knees bent at approximately a 90-degree angle. The feet only are held by another individual during the exercise. Count one, sit up so that the shoulders are directly above the hip/pelvis area or 90 degrees to the floor. Count two, return to the starting position. There is no authorized rest position for this exercise. If the member rests, the exercise is terminated. If the member’s buttocks rise from the ground or his fingers are not interlocked behind his head during the repetition, the repetition is not counted. Member will exercise to muscle failure or time completion.